The Evo is dead, or at least it's on life-support. And when it finally shuffles off this mortal coil, its soul will transubstantiate into… an SUV. That's the divine plan, according to Kanenori Okamoto, a Mitsubishi product head speaking with Autocar. "[The Evo] will not exist as we know it," Okamoto said in Paris. "It will be replaced in spirit by an SUV with high performance." The idea that the Evo's high-tech, all-wheel-drive system and turbocharged four-pot could be swapped into an SUV isn't completely daft, but the notion that it's somehow a spiritual successor to the rally-bred sedan isn't just laughable, it's insulting. Still, Mitsubishi is working on electrifying it's entire line-up, and some of that technology will come from its Pikes Peak hill climb efforts. 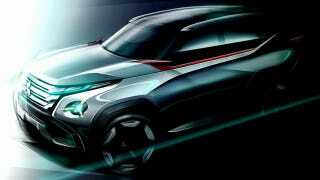 That will eventually filter down to the SUV, which Okamoto says will be part of Mitsubishi's future road cars. And that's all part of Mitsu's plan to balance greenification with an entertaining steer. "Green is still fun to drive," says Mitsubishi UK head Lance Bradley. "It's a challenge to make it fun, but not a particularly difficult one. Electric vehicle performance is very good."